The very first bar of handmade soap I fell in love with was a Dead Sea mud bar I used to buy at my local farmer’s market in Georgia before I moved. In fact, it was my love for this bar of soap that drove me to try making my own soap because I wanted to continue to use it, but I didn’t want to have to special order it from my new home in Massachusetts. 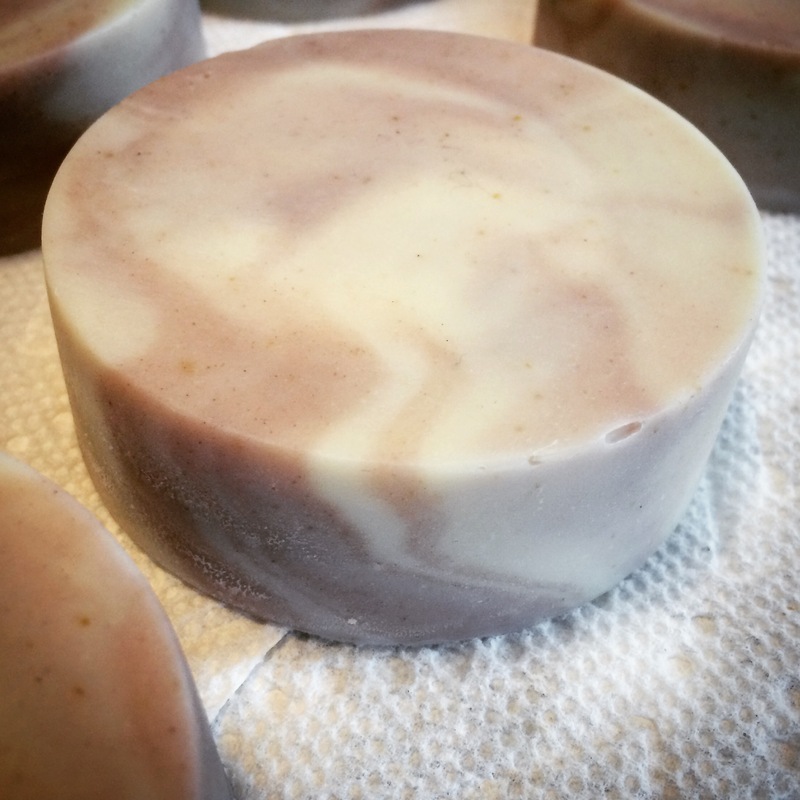 I started studying the craft of soapmaking, and eventually I formulated several different Dead Sea mud soap recipes, but for some reason, I never tried making them. 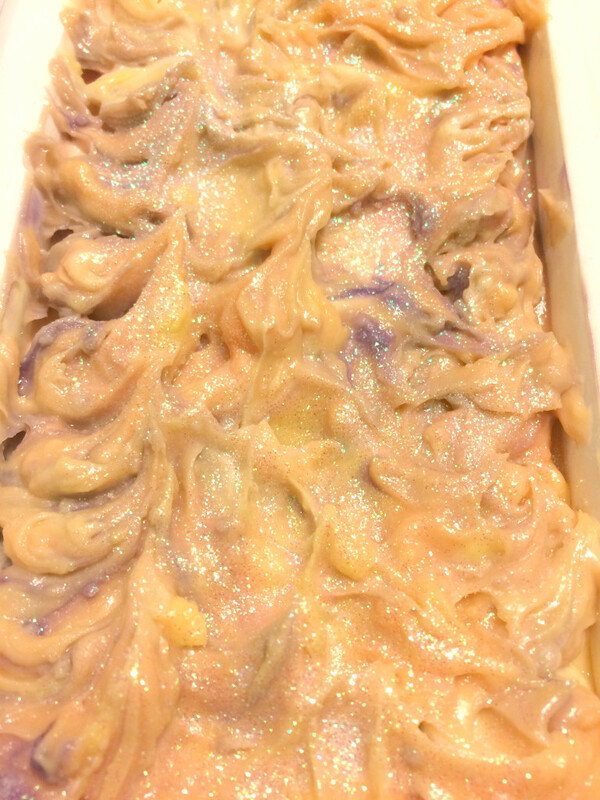 At first, I studied the ingredient label on my remaining farmer’s market soaps and tried to replicate the recipe, even in my other bars of soap, but as I learned more about oils and butters over time, I developed my own Dead Sea mud spa soap recipe, and I decided the time was finally right to create my own version of this soap. 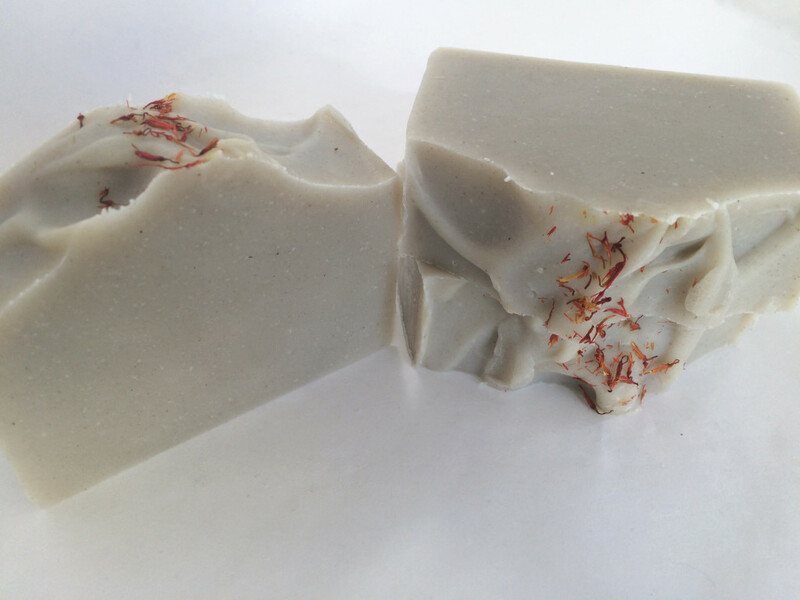 Why use Dead Sea mud in soap? Dead Sea mud is rich in minerals and salt that are good for your skin. Many expensive beauty treatments have Dead Sea mud among their ingredients. I purchased my Dead Sea mud from SoapGoods, but you can buy it many places. 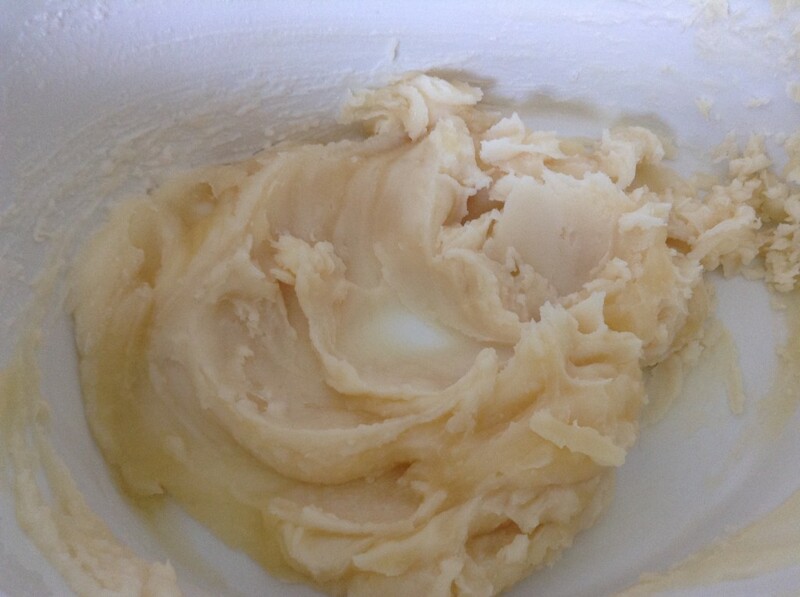 I used a 33% water weight as a percentage of oils when I formulated my recipe in SoapCalc. You can use more, but be mindful of the fact that you have Dead Sea mud in your recipe, and make sure you don’t use too much. I used a 6% superfat for the lye. I used a fragrance ratio of 50 grams per kilogram, or 5%. At this point, I should explain that I usually use grams instead of ounces because they are more precise. You can still use the same percentage if you are using ounces. You can use between 1 and 2 tablespoons of Dead Sea mud per 500 grams of oils. 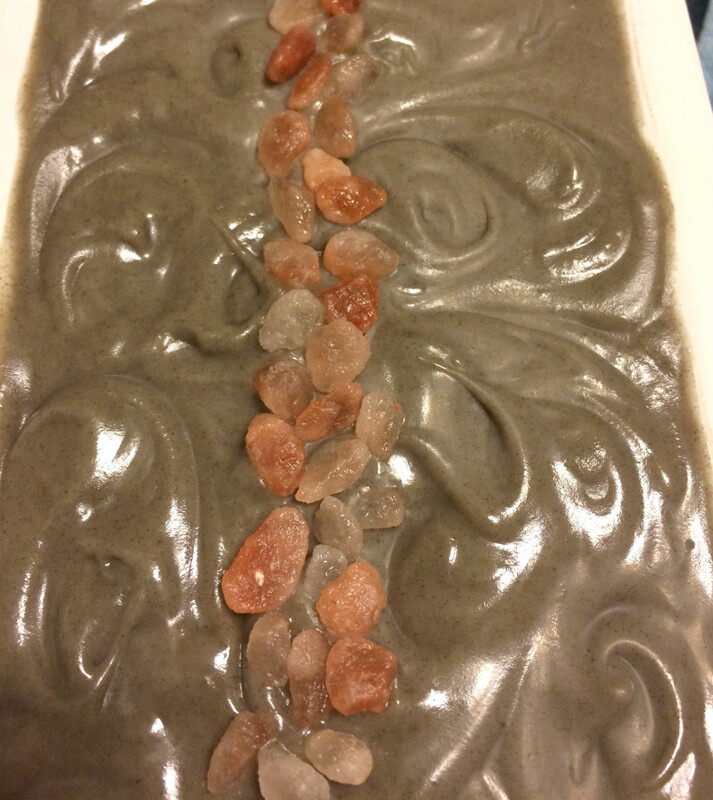 My recipe is 1,100 grams of oils, and I used 3 tablespoons of Dead Sea mud. You can use whichever fragrance or essential oil you like for this recipe. I used an essential oil blend of lavender and spearmint. I also put a pinch of tussah silk in my lye water (I usually do this with all my water-based soaps, but I find it too hard to dissolve the silk in milk-based soaps). 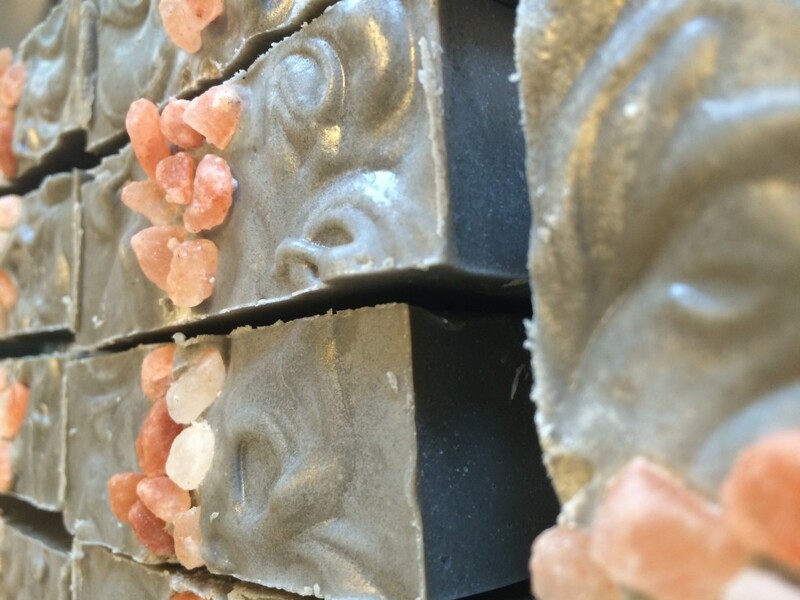 I also topped my soaps with Himalayan pink salt. You could easily omit the salt. Unfortunately, I didn’t take photographs of my process. 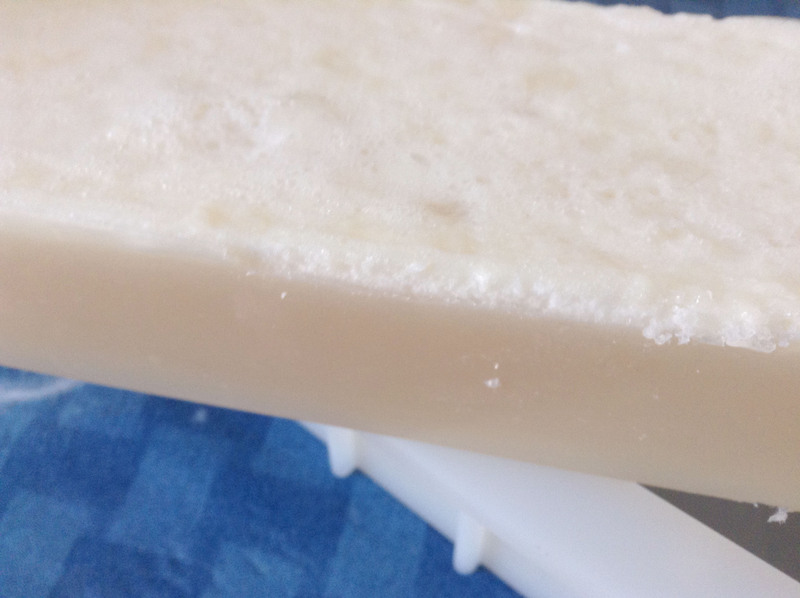 Note: The reason I use percentages in recipes I post on this blog is that your mold may be smaller or larger than mine, and using percentages allows you to use SoapCalc to adjust the recipe for your own mold. 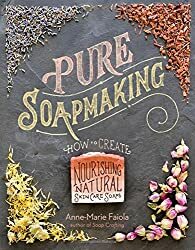 I wish more soaping books also used percentages, but I have noticed that many soaping blogs do. If you want to figure out how much oil will fit in your mold, use this formula for a rectangular mold, check out this link for more information on how to do that. And now seems like a good enough time for a giveaway, so if you’d like to win one of these bars of soap, enter the contest. 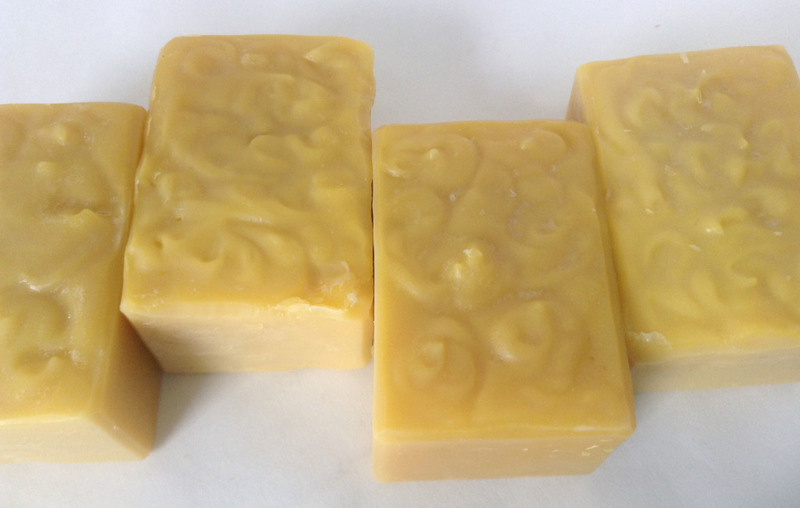 Please remember that soap takes four weeks to cure, so the soap will not be shipped out until June 5, 2015. Good luck! Open only to residents of the United States (shipping costs are high; sorry!). I decided to use the last of my S.O.A.P. Panel freebies, Mandarin Oasis. I didn’t test this fragrance on the S.O.A.P. Panel—it was not one of my eight fragrances, but it was one of the fragrances tested by the second panel last year. 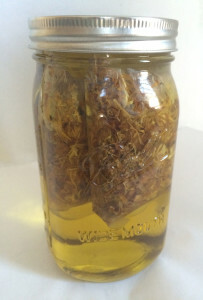 Testers received two ounces of each of the fragrances that were ultimately selected for sale. This fragrance smells great for both kids and adults! Similar to Energy, one of our top selling fragrance oils, Mandarin Oasis has a sweet orange top note but with a sophisticated undertone. Mid-notes of papaya, ginger and thyme really hold this fragrance together giving it a sweet and sultry aroma. Crisp notes of cotton, teakwood, and neroli make this fragrance extremely versatile for projects ranging from personal perfume, laundry soap, or sugar scrubs. Take your senses on a mini-vacation! I don’t smell the similarity to Energy myself, but I do smell the sweet notes in the fragrance. I’m not sure I pick out a mandarin orange scent. It doesn’t smell spicy to me at all. I think I do detect the neroli. My nose is not the most sophisticated in terms of making distinctions among all the layers in a fragrance. However, Mandarin Oasis does smell absolutely gorgeous. It’s very feminine. 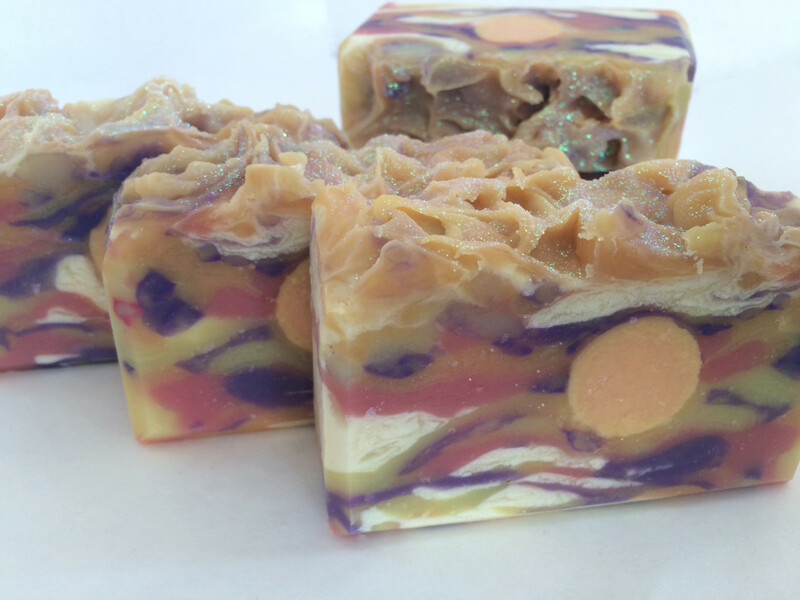 I’ve written before about using the color wheel to create soap designs. But I don’t use the color wheel alone when thinking about which colors to use. I also think about what colors match the fragrance. When I think mandarin, the first color that comes to mind is orange. I toyed with the idea of an orange, black, and white color scheme for this fragrance, but the more I thought about it, the more I didn’t think it fit this particular fragrance. I think quite a lot about colors that match the fragrances I use. The image Bramble Berry attaches to this fragrance is black palm trees at sunset. It’s pretty, but it doesn’t quite evoke the fragrance for me either. It seems a little too dark. However, it did give me an idea. What about using sunset colors? The beautiful oranges, pinks, purples and yellows could work well with this fragrance, and pops of white could help bring the whole look together. The first thing I did was make an orange embed to represent the setting sun. I neglected to take a photo of it. 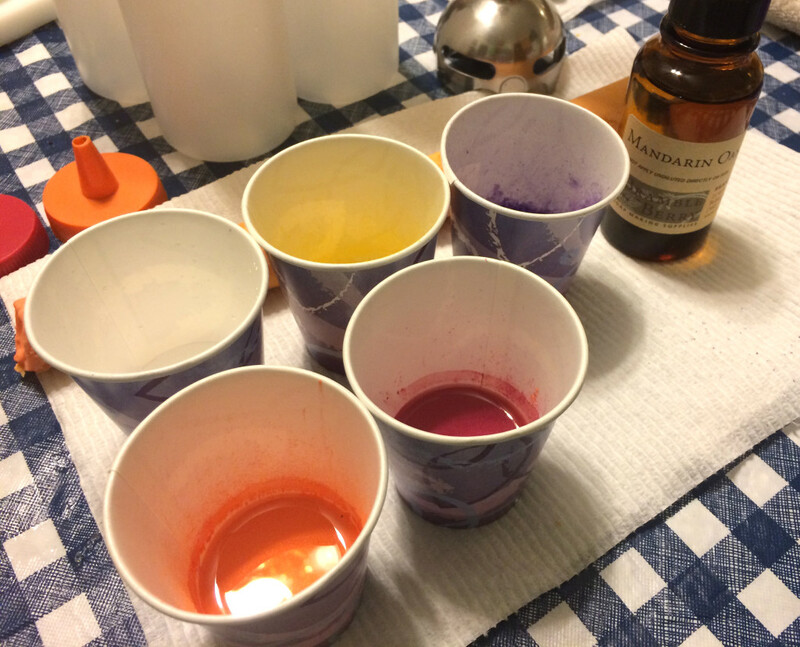 I put together my colorants: Rustic Escentuals’s Clementine Pop Mica, Nurture’s Purple Vibrance, Yellow Vibrance, and Pink Vibrance, and titanium dioxide. I mixed the colorants up and decided to use squeeze bottles to make a layered design. I would not do this again. 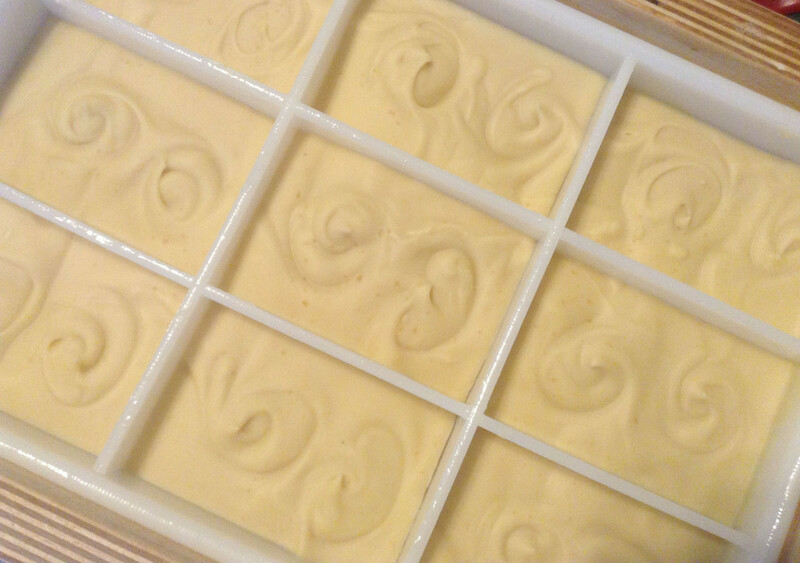 The soap set up a little bit fast, perhaps because of the floral notes in this fragrance or perhaps because of my recipe, but it was very difficult to squeeze by the end. I attempted to create a video of the process, but it wound up being too long and difficult to capture. I took a picture of the top before I put the soap to bed, but the lighting was not too good by that time (it was after 10:00 PM). The next day, I cut the soap. Given how it set up, I was happy with how it turned out. It doesn’t look precisely like a sunset. 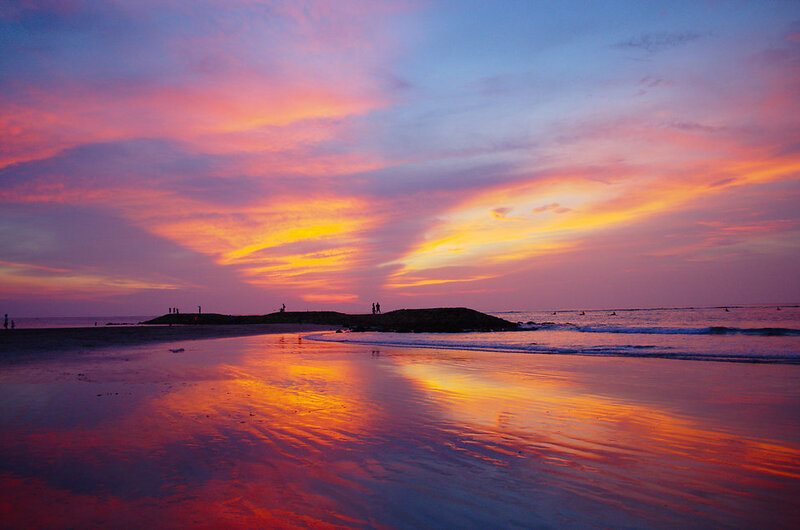 It reminds me more of an impressionist painting of a sunset. Perhaps you can see the glycerine rivers in the titanium dioxide. I think sometimes this look suits better than a solid white, and in this case, I’m happy they happened. They look a little bit more like wispy clouds than they might otherwise have done. 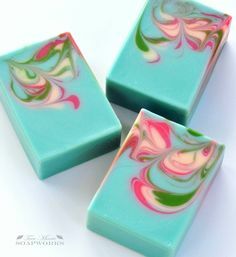 If I were to do this soap again, same colors and all, I might try to use a spoon to create the same effect, as the squeeze bottles proved difficult to use, especially by the end. Truth be told, I’m not a huge fan of using squeeze bottles in soap designs because they are terribly difficult to clean. I thought they might be faster than using a spoon, but I’m not so sure. I took about two hours to make this soap from start to clean-up. It wouldn’t look exactly the same if I had used a spoon. 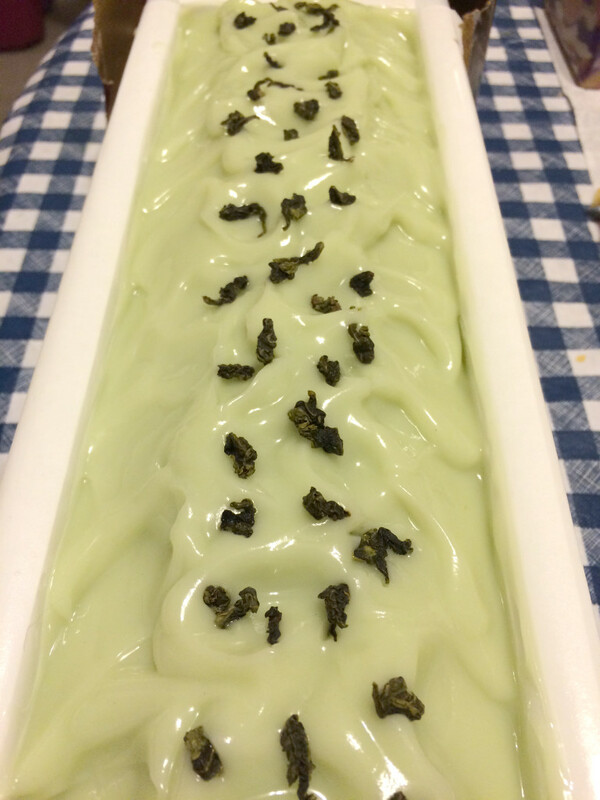 On a less complicated note, when a wholesale customer of mine asked for Green Tea & Cucumber, it seemed like a no-brainer to create a soap with a subtle green hue, much the same shade as cucumber flesh. How to get that hue, however? Chromium green oxide might have been a good choice, but it tends toward a moss hue. I wasn’t sure I wanted to use a mica either, as they tend to be more vibrant, and I needed something subtle. Hydrated chromium green oxide is not quite as dark as chromium green oxide, and it has a teal note to it that I thought might work well. The trick is to use just a scant amount. I think I may have used less than 1/8 teaspoon to color this whole batch. This fragrance smells just like freshly steeped green tea with a hint of cucumber. It isn’t your typical sweet cucumber fragrance. The earthy green tea is the most upfront aroma in this fragrance oil giving cosmetic products a fresh and clean scent. The beautiful thing about soap is that you can use whatever fragrances and scents you want, and you can match colors with fragrances, or you can use whatever colors you want with fragrances. What do you do? Do you try to match colors with scents? If you have tips, feel free to share in the comments. I have admired the way soaps made with Cambrian blue clay look for some time. Once when placing an order with one of my vendors, I decided on a whim to purchase some Australian washed blue clay, thinking it was the same thing as Cambrian blue. As it turns out, it’s not. 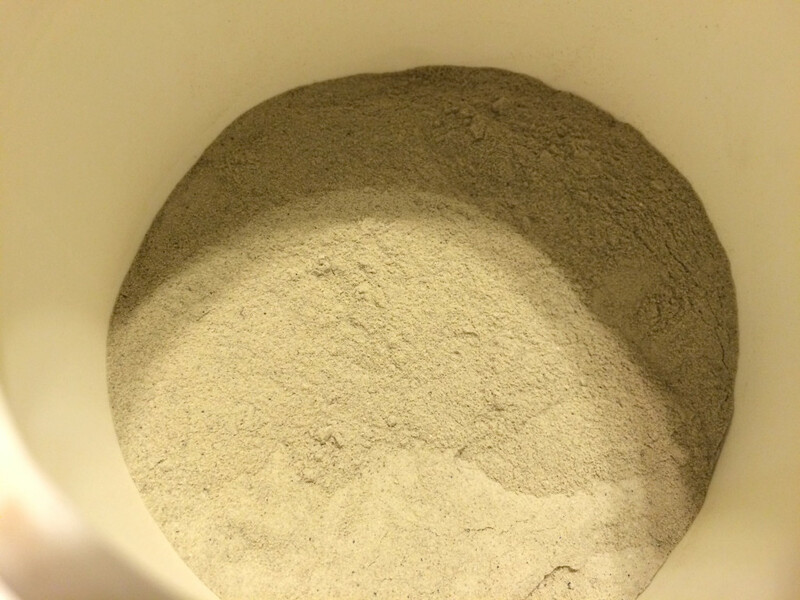 After doing some research, I discovered that Australian washed blue clay is actually a kind of bentonite clay. 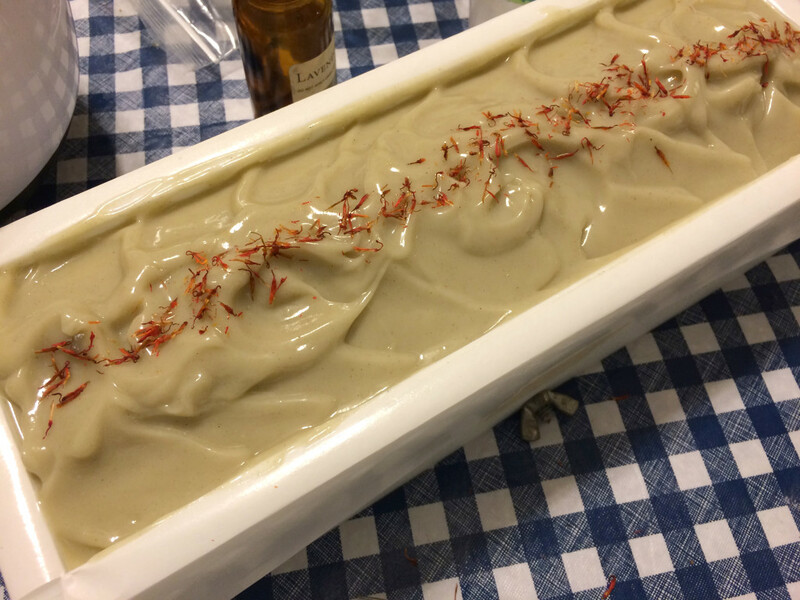 I have used bentonite clay before in shaving soaps because it adds slip, but I hadn’t tried it in a regular soap before. I know that it’s considered to be good for acne, but I decided it was probably fine since I have used a bentonite-clay based shaving soap on my legs and suffered no dryness as a result. I’m not sure if everyone sells Cambrian blue clay wet, but Bramble Berry does. Obviously, my Australian washed blue clay is dry. I thought it looked sort of green, but it’s hard to tell with clay until you get it wet, and even then, it doesn’t always look the same as it will in soap. I decided I would experiment with it anyway because even if it turned out green, that would work just fine with my planned batch. I had decided to use the Lavender & Cedar fragrance oil that Bramble Berry sent me as a thank you for participating in the S.O.A.P. Panel last year. I haven’t seen too many people talking about this fragrance in soaping circles (or perhaps I’m not looking in the right places, which is entirely probable). Bramble Berry does warn that the fragrance loses some of its camphor notes in cold process, which suits me fine. I also thought that it would work well with either a green or a blue soap, so it would be perfect for my experiment with Australian washed blue clay. 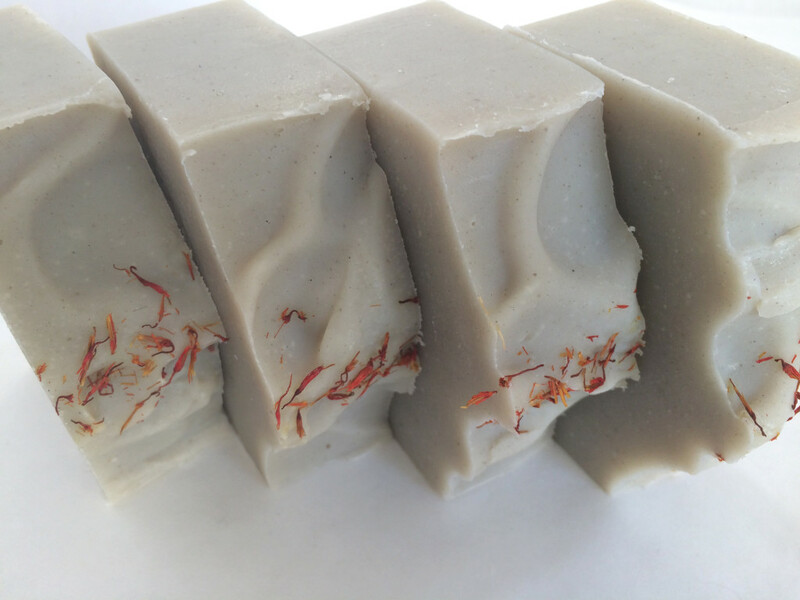 I use kaolin clay in most of my soaps because it adds silkiness and creaminess and also helps anchor fragrances so they stick better. 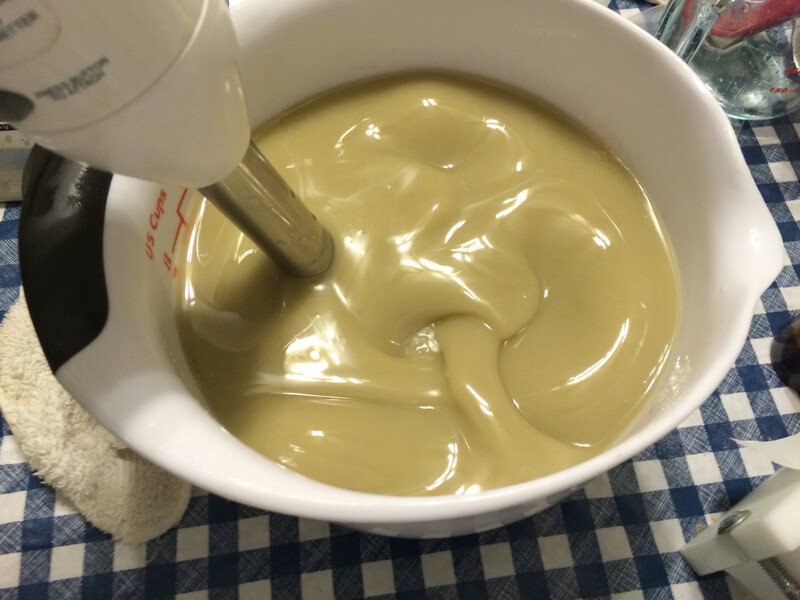 French green clay is a staple of my Provence soap. 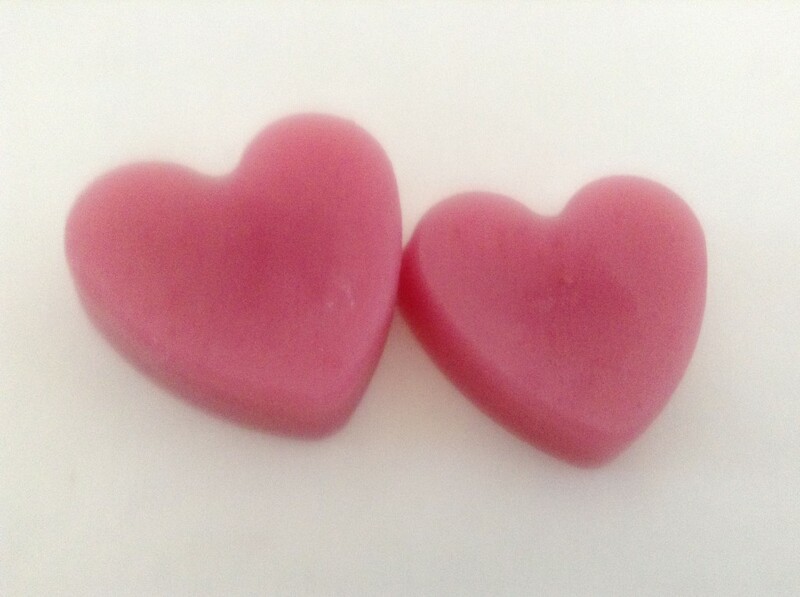 I have used pink rose clay (a form of kaolin) to color some soaps as well, and I have used rhassoul clay in my Guinness Beer soaps. I almost always just add my clay directly to my oils and stick blend before adding my lye. 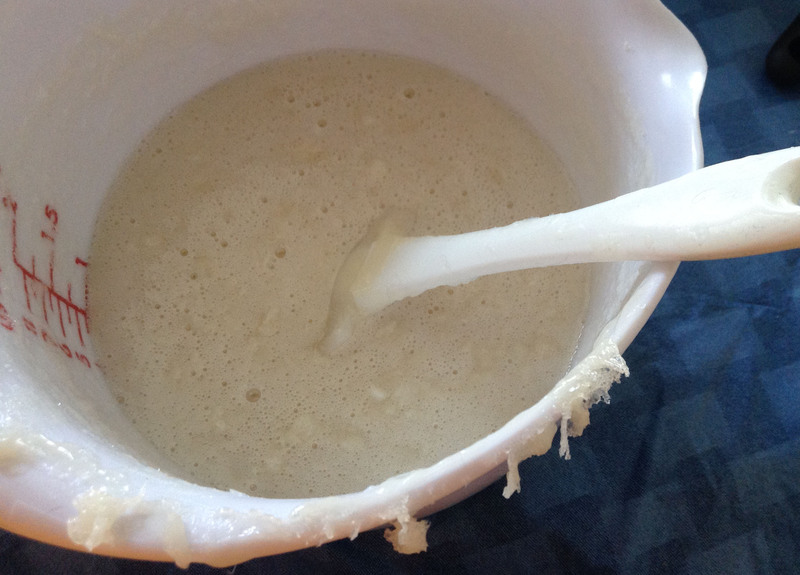 I have had the fewest number of problems with mixing when I have followed this method for using clay. Another method includes adding clay to the lye water (which you would also only do if you were coloring the soap with the clay only). I have never tried adding it to my lye water. 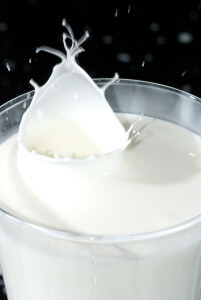 A third method involves making a slurry with clay and water or clay and oils. 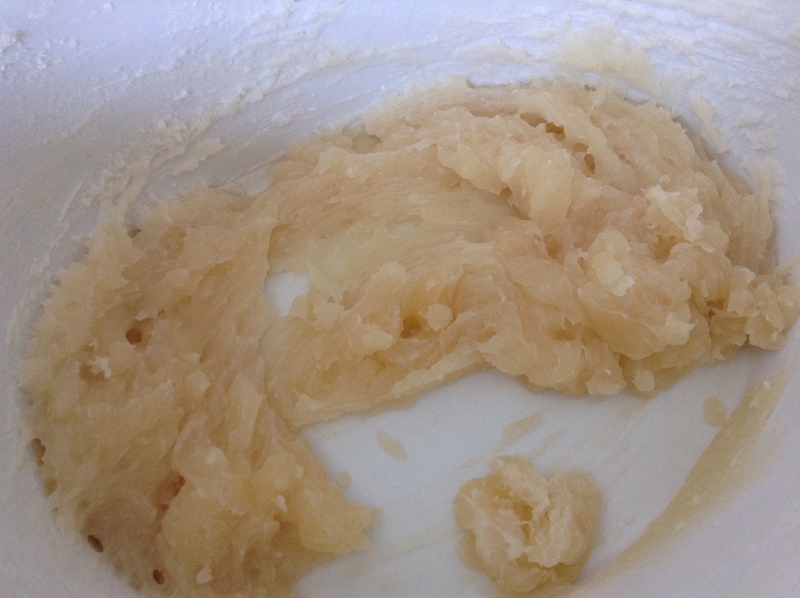 I have sometimes had clumps in my clay when I have used this last method, especially if I make a slurry and then add it to a bit of the soap, and then add the colored soap to the rest of the batch and blended as David Fisher describes here. 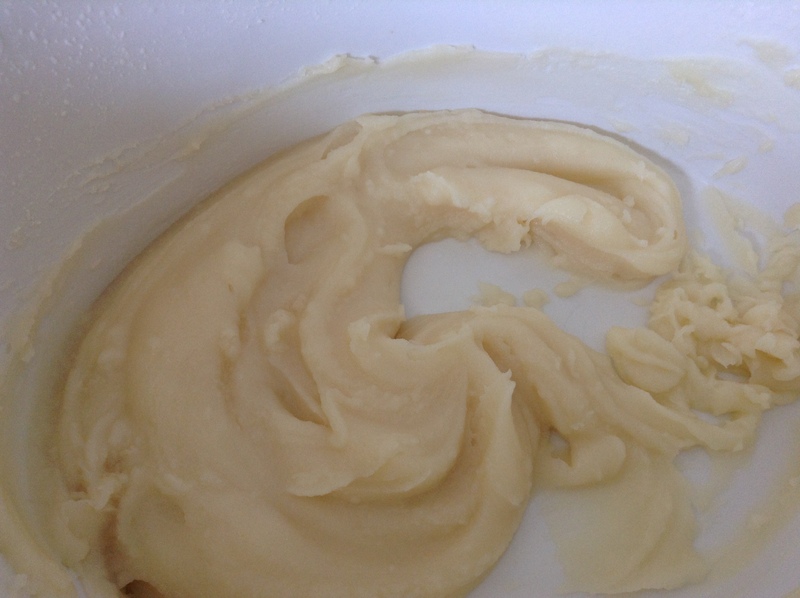 I have had the best luck with this method if I just treat the clay like any other colorant and add the oil or water and clay slurry directly to the soap and blend. 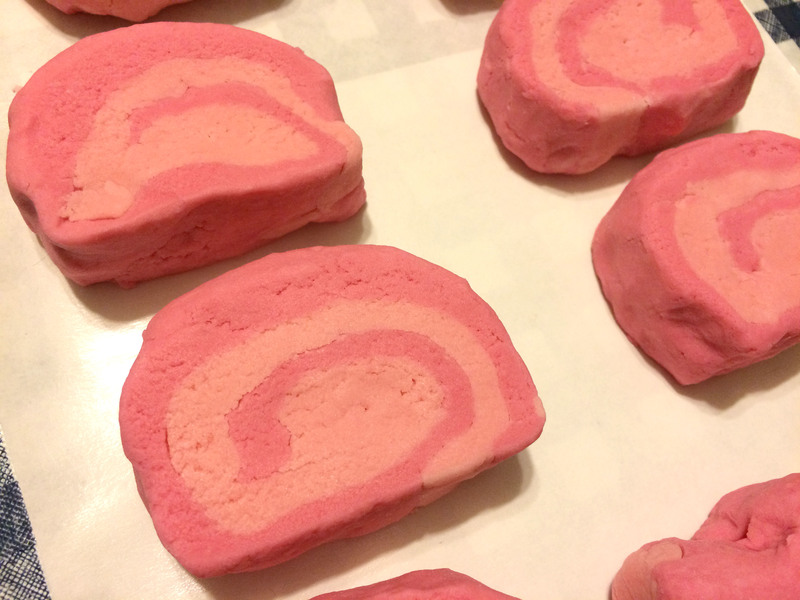 If you are doing a swirl or using other colors, it’s the method to try. Since my Lavender & Cedar soap was going to be one color, I decided to add the clay to the oils and blend. It definitely looked green, but the final test would be adding the lye water and blending. 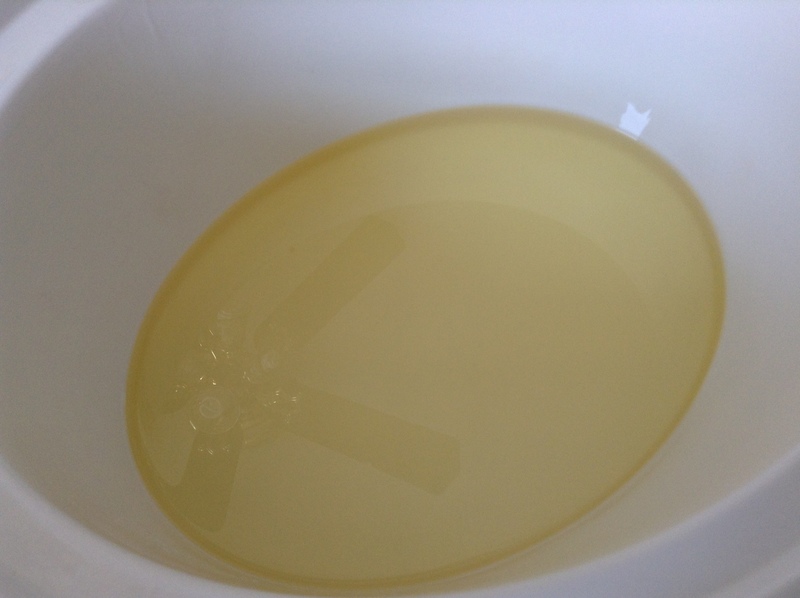 Sometimes the color of the soap lightens once the lye is blended well with the oils. 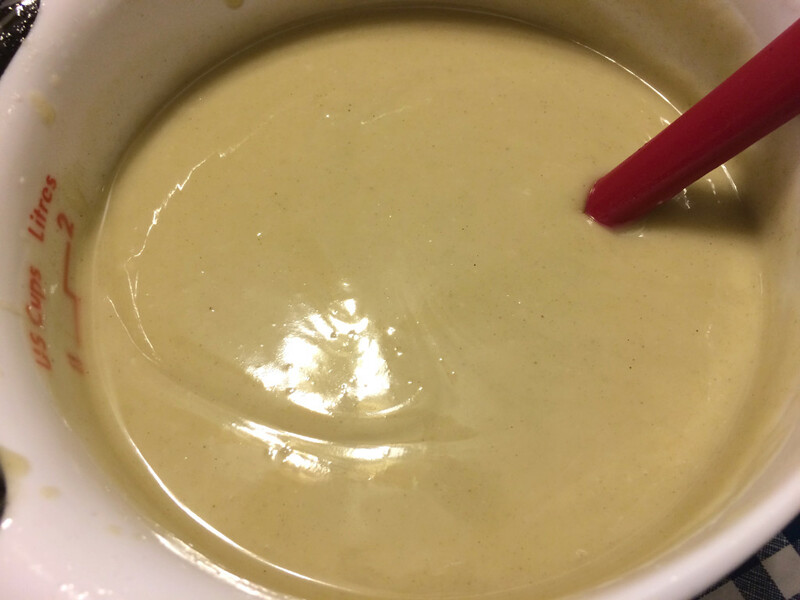 In the early blending stages, it looked a lot like French green clay to me. Once I was done blending, sure enough, it was still green. It’s pretty, but it’s sure not blue. I poured the soap into the mold. I decided to sculpt the tops a bit and add some pretty safflower petals. 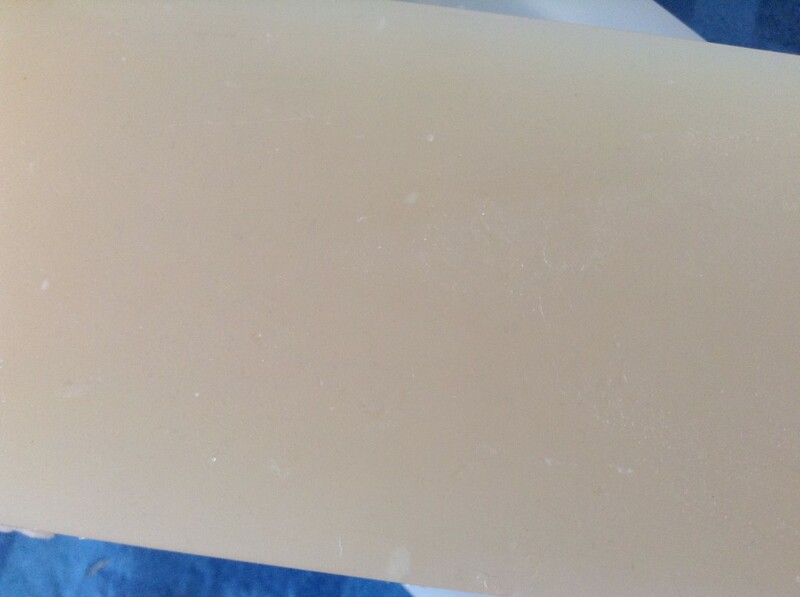 In the close-up, you can see the soap has tiny flecks in it. Neither bentonite or French green clay does that (at least in my experience), and I really like the look of it. It’s not quite the same shade as French green clay, but it’s not far off. 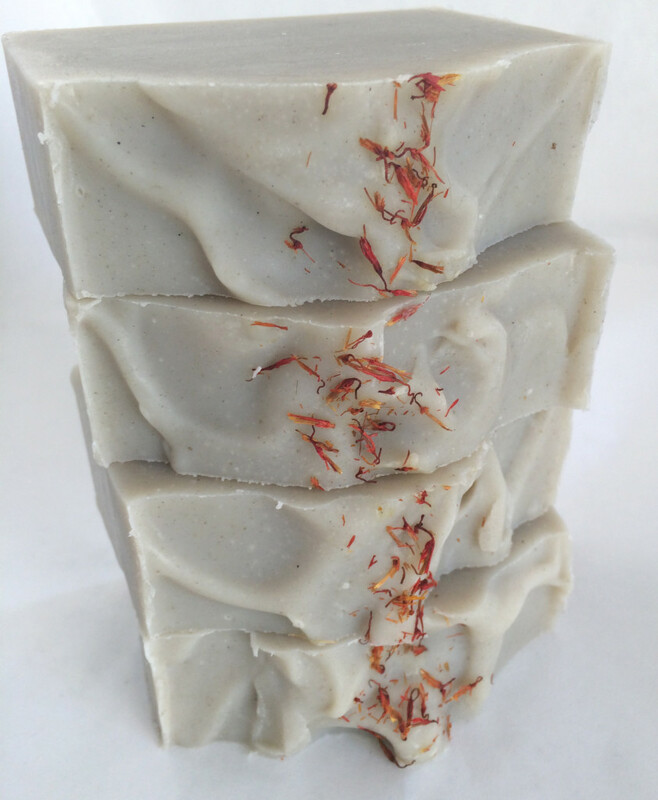 The safflower petals set it off nicely, but they would also have looked nice with a blue soap. 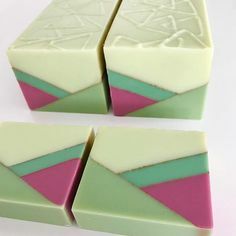 I would just have to wait for the unmolding and cutting to see what the soap would ultimately look like. So what happened in the end? A lovely shade of green. Definitely nothing remotely close to a blue. 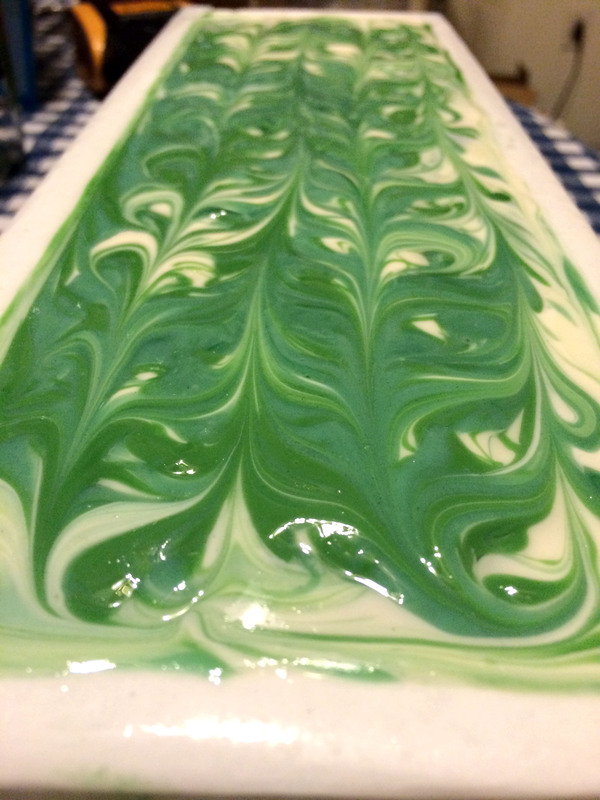 For the record, I gelled these soaps, too, so if it were likely to morph or change color at all, it would have done so. The real shame here is that you can’t smell them, looking at them on your computer screen. Oh my, do they smell good. A nice scent of cedar underlaid with the floral lavender and some other more complex woodsy notes I can’t quite pick out. Ultimately, I think the color is perfect for the fragrance. It doesn’t quite look like French green clay, either. 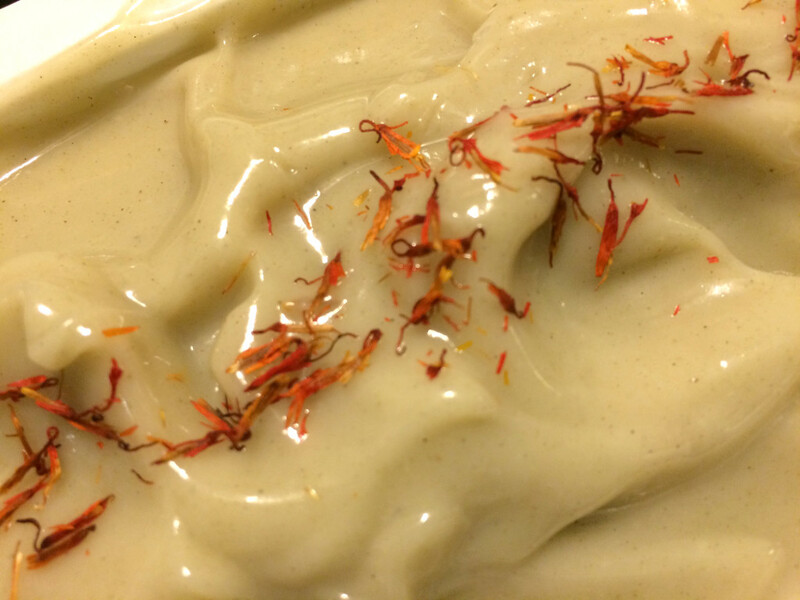 The flecks in the soap are quite pretty, and the color does look nice with the safflower petals. The soaps have a nice, silky feel. Even though the results of my experiment were not what I had anticipated (a blue soap along the shades of a Cambrian blue clay), I’m still quite happy with them. 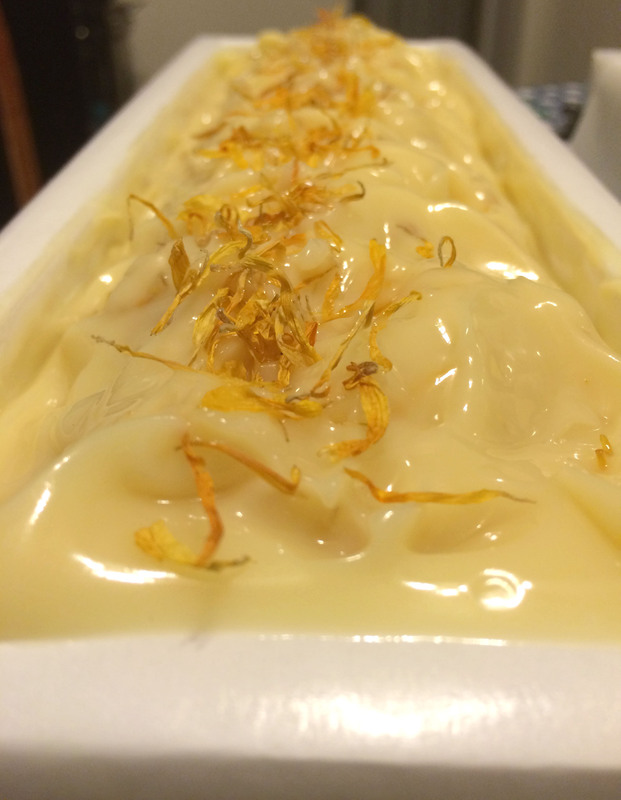 I love the fragrance, and really hope my customers enjoy the soaps. 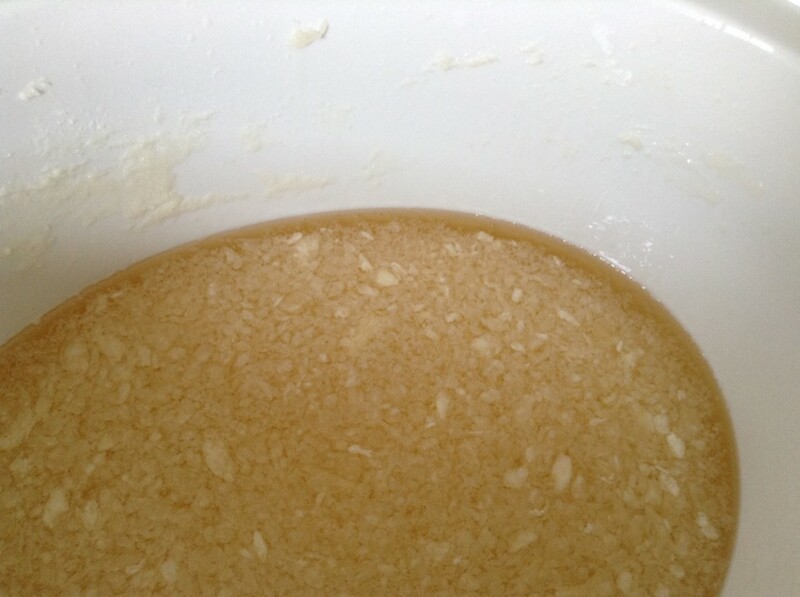 Some time back, I blogged about color theory as it related to selecting colors for soapmaking. In that post, I discussed that one way to create an appealing color combination is to use complementary colors, or colors that oppose each other on the color wheel. You can see that purple and yellow directly oppose each other on the color wheel. However, orange and green also oppose purple on the color wheel and form a triangulation of complementary colors. In between purple and green (the darker green), there are three colors, and in between purple and orange (the lighter orange), there are likewise three colors. There are again three colors between orange and green. These sorts of triangulations are also worth considering when you are thinking about color combinations. 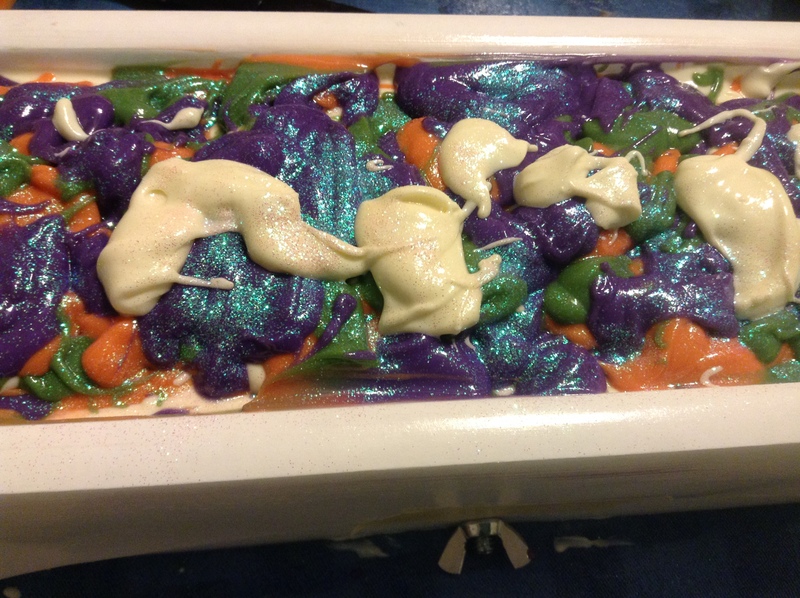 This sounds interesting in theory, but in practice, how do these colors look together in soap? The images in the top and middle rows caught my eye. The first two images in row one are straight from Bramble Berry’s site. 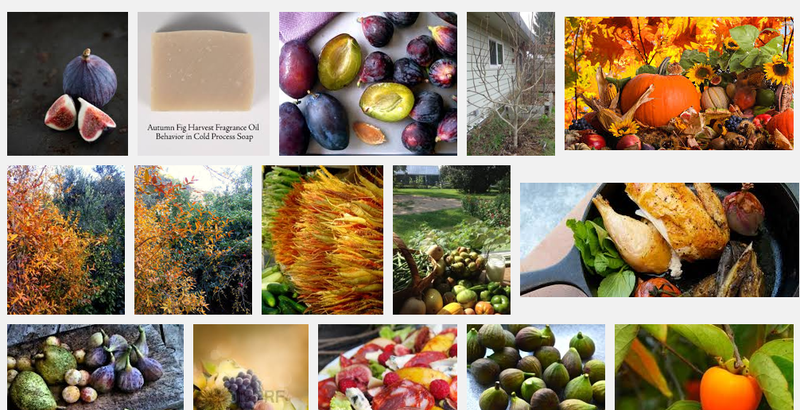 The third image, however, comes from a cooking blog called Figs, Bay & Wine. Notice the green and purple in the plums. As I said in my earlier post about color theory, turning to nature for color combinations is often a good idea because nature understands color theory. Finding that picture was a lucky accident because I was not searching for plums at all. Skipping over the fourth picture, notice the third image is a pumpkin in a fall setting. My eye was drawn to how these colors looked next to each other: purple, green, and orange. Even though those colors (with the exception perhaps of purple) have little to do with figs, I knew I had found the color combination I wanted to use. 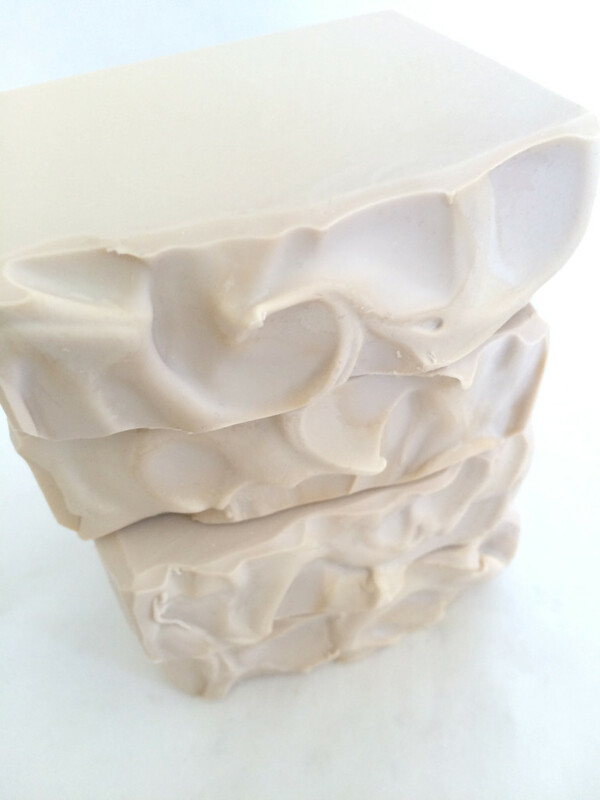 Celine Blacow has said in her soapmaking videos that using white is often what brings a color combination together. 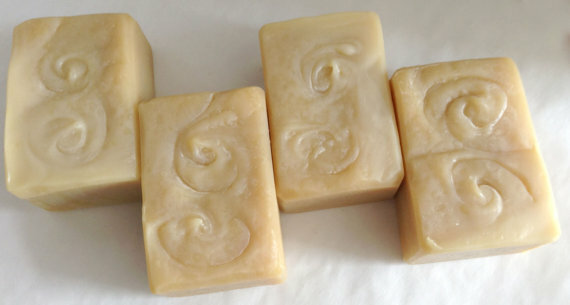 I have noticed the difference white makes in pulling together the look of a soap. 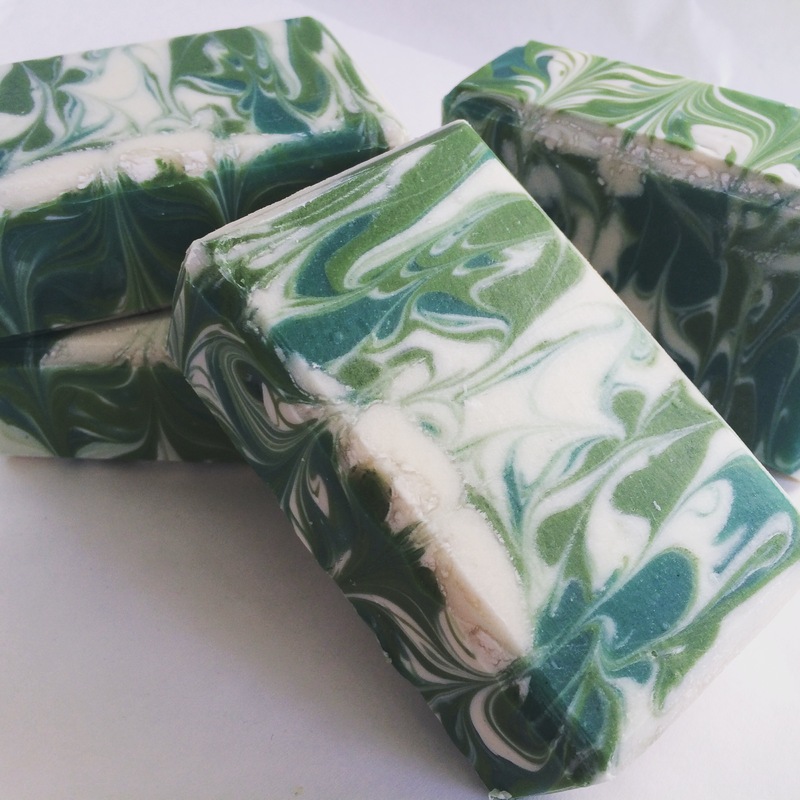 It’s not always necessary, but it often does make a huge difference in the soap’s design. So, a field of white would be important in pulling together a design with purple, orange, and green. I thought the three colors would have an autumnal look as well. 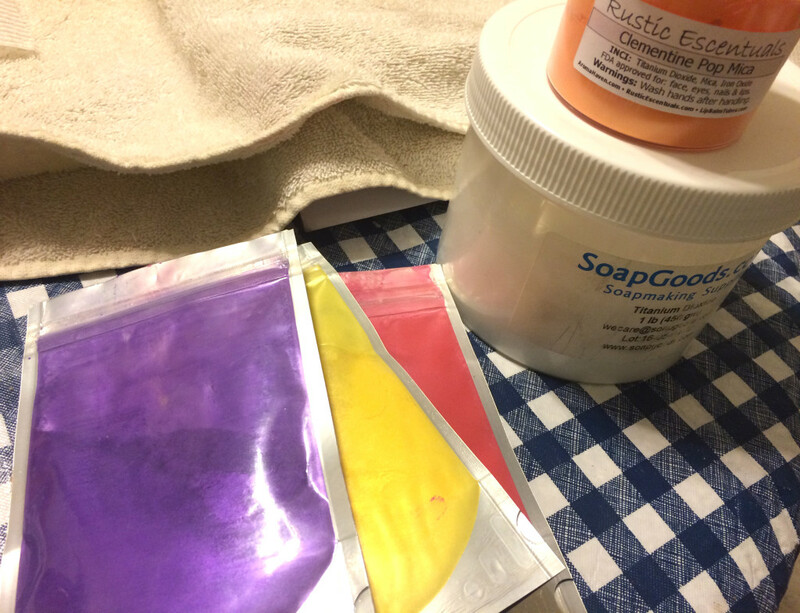 Purple can be tricky in soap if you just use oxides, but I had recently purchased a set of Vibrance Micas from Nurture Soap Supplies. I used the Vibrance Purple and Green micas, and I probably could have used the Vibrance Orange from this set as well, but elected to use Clementine Pop Mica from Rustic Escentuals. I had used it before, and I knew it would make a nice pumpkin shade in the soap. 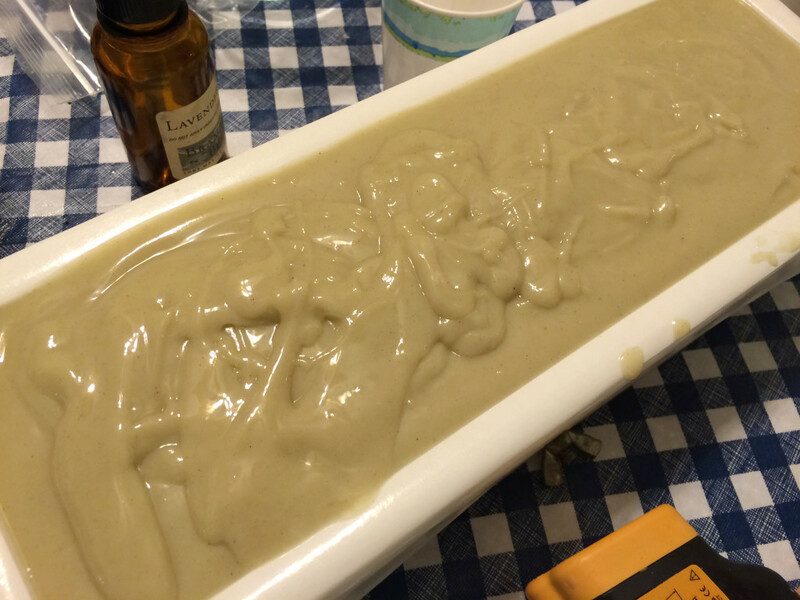 Here is what the soap looked like in the mold. First I poured in a layer of white, then I did a drop swirl with each of the other three colors. I decided to try the spatter-top technique (a sort of Jackson Pollock effect). Just like using white, I have found that a bit of glitter also adds something extra special to soap. 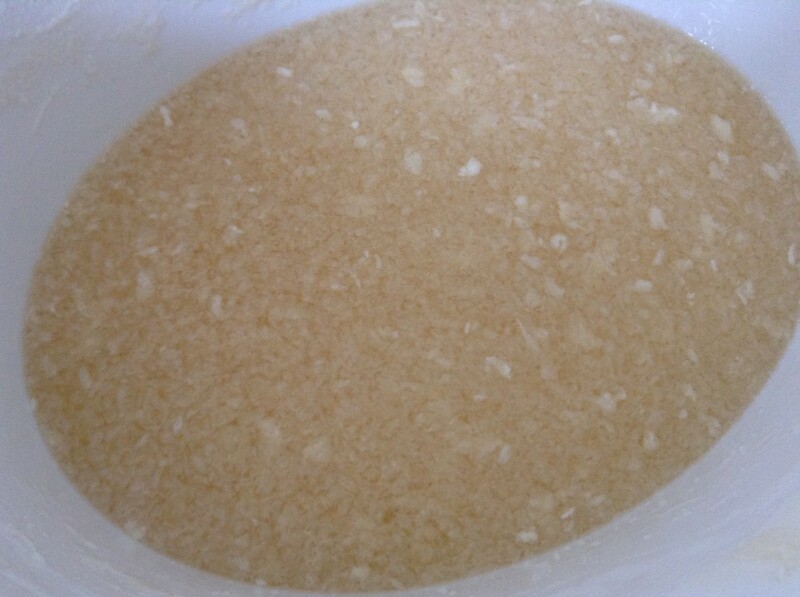 You will notice I have a bit of titanium dioxide crackle, also known as glycerine rivers, in the soap in the white parts. There are many intriguing theories about what causes them—the most recent interesting one I came across is the amount of water used in the lye solution—but frankly, I haven’t been able to figure out why they happen sometimes and don’t other times. 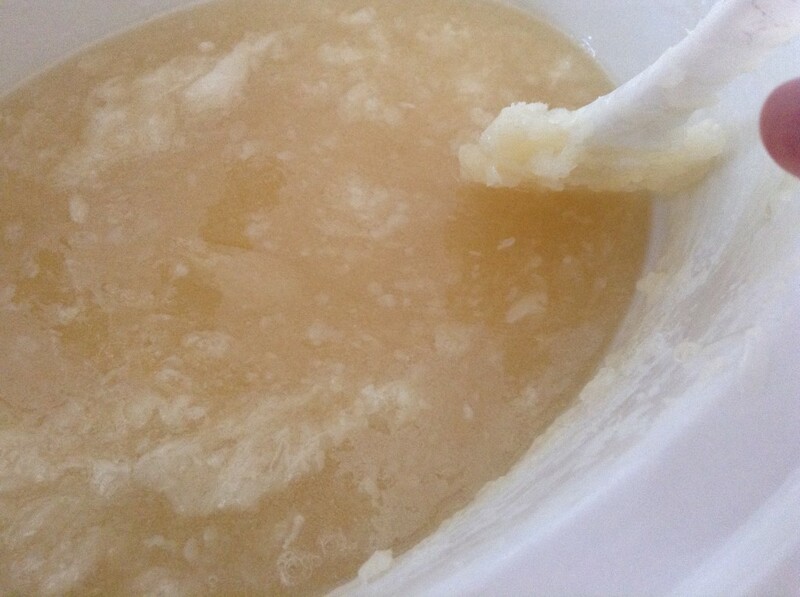 I believe them to be the result of heat because when I do not gel my soaps, I never have them. 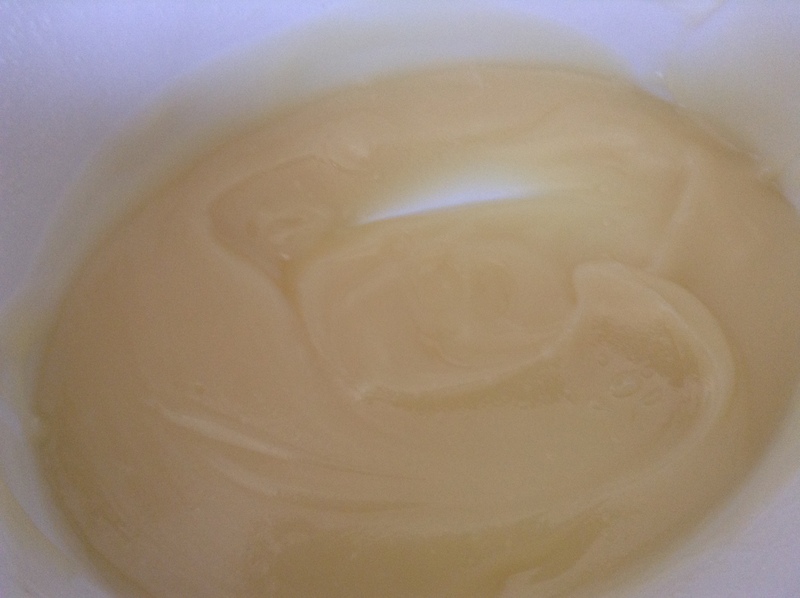 However, gelling soaps produces more vibrant colors and allows soaps to be cut and eventually used earlier than non-gelled soaps, and when I can, I try to gel them. Actually, the TD crackle is an interesting look. I’m sure other soapmakers see these soaps and think of them as mistakes, but the sort of antique look of TD crackle can lend interest (of course, that’s also just my opinion, and I’ve stopped trying to fight it). The colors do look nice together. They make a bold statement, perhaps because they are triangulating colors. Try moving the triangle around the color wheel to come up with other bold combinations: red, yellow, and blue; violet-red (cranberry), orange-yellow, and light blue. In each case, the combination is a striking mix of complementary colors. Another combination of colors to try is the square. Again, a striking combination of colors. In the example above, orange, yellow-green (lime), blue, and violet-red (cranberry). 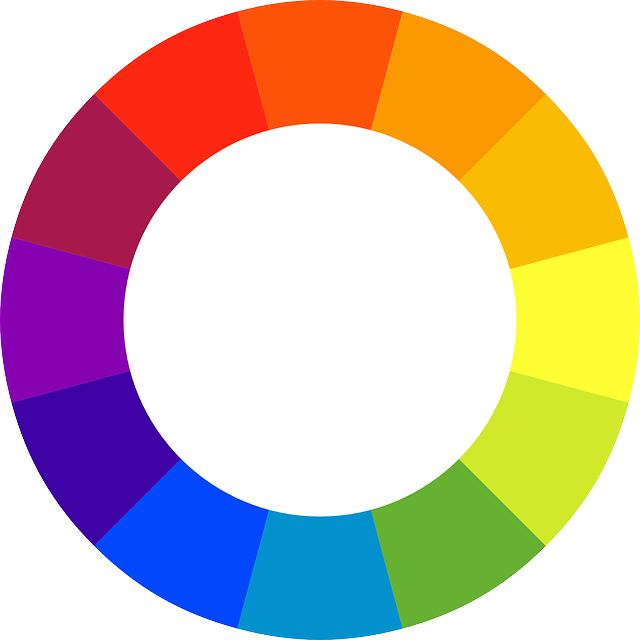 Each of the colors is two apart, which sets them off a little more than analogous colors (think red, yellow, and orange as analogous) would do. Try moving the square around the wheel to create other combinations. Playing with color combinations using the color wheel can help you create appealing soap color combinations. 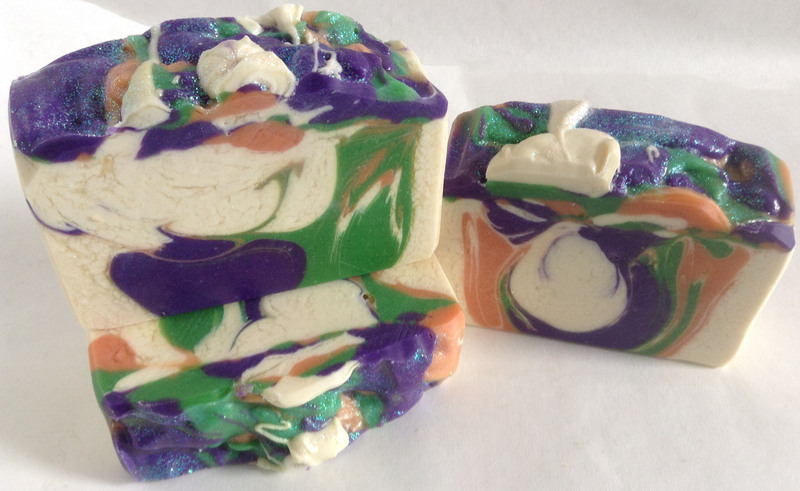 Have you used the color wheel in your soaping creations? What were the results? How do you decide what colors to use? Chime in the comments!